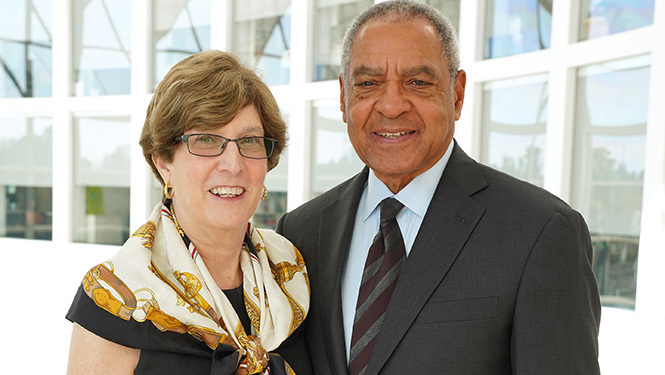 Oct. 8, 2018 — Grinnell College Trustee George Moose ’66 and his wife Judith R. Kaufmann have established the Program for Experiential Learning in Public Policy with an endowed gift totaling $840,000. The program will promote the development of ethically-informed, public minded student leaders and College graduates. Its principal purpose is to encourage students to consider careers in public service, as well as to help ensure that students can afford to participate in related career development opportunities. Administered by the Rosenfield Program in Public Affairs, International Relations, and Human Rights, the gift will support programs that provide students with direct, practical experience in public policy. One area of specific support is the reinvigoration of Grinnell’s Program in Practical Political Education (PPPE), which facilitated student involvement in politics in the 1960s. Moose was involved in the PPPE as a student. The College plans to establish revised goals for the PPPE that include promoting interest in public service at Grinnell and enhancing the free flow of ideas important for strengthening U.S. democracy. 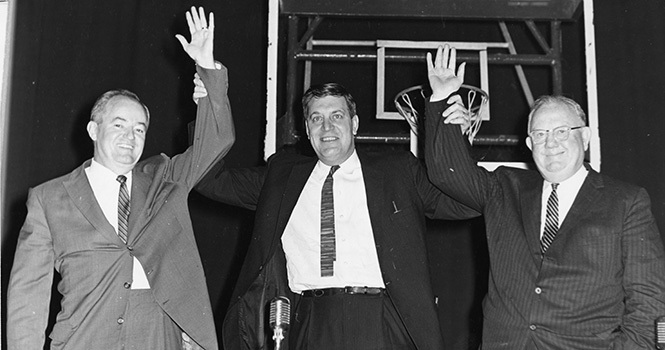 Hubert Humphrey, left, Clark Mollenhoff, and Homer Capehart visited the College in November 1961 for a PPPE event. Moose and Kaufmann, both career public servants with experience in senior policy positions with the U.S. State Department, met while in the Foreign Service. Reflecting on his time as a Grinnell student, Moose cites his interest in public policy matters – primarily the civil rights movement and Vietnam War – in his early understanding of the connections between politics and policymaking. “Our experiences overseas and in Washington D.C. made us intensely aware of the need to support the development of students who will be our next generation of policy makers and practitioners, and to equip them with the knowledge and understanding to pursue public service within an ethical framework,” Moose says. A career member of the U.S. Foreign Service, Moose attained the rank of career ambassador. He was U.S. ambassador to the Republic of Benin and to the Republic of Senegal. He also has served as assistant secretary of state for African affairs and as the United States representative to the European office of the United Nations in Geneva. He is currently vice chair of the U.S. Institute of Peace board of directors. Kaufmann served as director of the Office of International Health Affairs of the U.S. Department of State. She now is as an independent consultant on diplomacy for global health. Both Moose and Kaufmann believe their careers were profoundly influenced by sponsored work-study programs, internships, and exchange student experiences in places like Brazil, Tanzania, Washington D.C., and Mexico City. Internships, course-embedded travel, and other experiential opportunities will be among activities supported by the Program for Experiential Learning in Public Policy, with the aim of helping students explore the development of public policy and its impact on people’s lives. "A key purpose in establishing this fund is to help support students who otherwise may not be able to afford unpaid experiences, which we see as vital for their professional success,” Moose says. Grinnell College President Raynard S. Kington announced the gift Friday during the College’s Board of Trustees meeting. Moose has served on the board since 2014. The new fund will also support strategic endeavors of the Institute for Global Engagement (IGE), which promotes an integrated approach to international education across the College, including national and international projects that explore global problems and challenges. Although established by Moose and Kaufmann, the Program for Experiential Learning in Public Policy is open to support from all donors. For more information about gift options, contact the Office of Development and Alumni Relations at 866-850-1846 or send an email to alumni@grinnell.edu.